I thought about a lot of possible headlines for this post. “Most Muddled Ethics Statement of the Century” was a real contender. I thought about making it an Ethics Alarms quiz, with the plaintive query,“Can anyone please tell me what the heck Paul McCartney thinks he is saying?” And, yes, I thought about skipping the story completely, as I am not eager to rattle the cages of the zealous pot enthusiasts, several of whom bombarded me, my business and my wife with vicious and threatening e-mails last week. But this cannot pass without comment. Paul McCartney has given an interview to Rolling Stone in which, among other things, he announces that he is giving up smoking pot as a responsible father of an eight-year-old girl. This is completely bewildering. Is Paul saying he’s had his fill, and now that he has, come to think of it, it’s irresponsible to smoke pot? Is he expressing regret? Is he doubting the wisdom of his aggressive drug advocacy over the last 50 years? Retracting it? Is he saying that parents shouldn’t smoke cannabis? That responsible people shouldn’t? That it’s wrong–irresponsible—to encourage a child to break the law? To use drugs? McCartney is 69—now he thinks its time to be responsible? Was he irresponsible for the first eight years of his daughter Beatrice’s life? What about he grown children? What does “I smoked my share” mean? That after the first 50 years of pot, the responsible thing is to quit? Huh? What does he mean, “you just don’t seem to think it’s necessary”? That once he thought drugs were necessary, but now he thinks they’re not? Or that after a half-century of getting stoned, he’s bored with it? It’s no longer necessary for him? That he now believes it was never necessary? What are you trying to tell us, Paul? 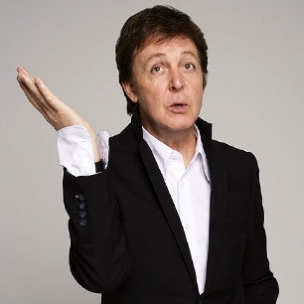 When Paul McCartney, led by his late wife Linda, became a vegetarian and an animal rights advocate, he was clear that he had concluded that eating animals was wrong, and wanted to use his influence and celebrity to change cultural attitudes about eating meat and being cruel to our fellow living things. He didn’t say, as far as I can find, “I’ve eaten my quota of meat, and at some point you’ve had enough—on to tofu!” His ethical message regarding animals was clear. Eating meat is unethical—for everyone. His message on drugs and parental responsibility, in contrast, is gibberish. The main lesson to take from this episode, it seems to me, is that while celebrities, because of their visibility and cognitive dissonance, serve as role models—and make no mistake, The Beatles were certainly that—many of them are intellectually and ethically unfit for the job. This week, at the Grammys, McCartney again displayed the depth of his artistry and the endurance of his charisma, leading the greatest rock guitarists on the planet in a boffo finale with his “Abbey Road” compositions (with John Lennon, of course), “Carry that Weight” and “The End.” Nobody watching is likely to forget it. I’m glad you’ve given up pot, Paul, whatever your reasoning. Now shut up and sing. To write popular music you don’t have to be the sharpest knife in the thing you put the knives in. You can be a sports legend and still be a fry short of a Happy Meal. It’s our fault for imposing role model status on people who happen to be gifted artists or athletes. I love Van Gogh’s paintings but, nevertheless, I wouldn’t ape his otological choices. Really, Peter, you wouldn’t lend him an ear? Only for friends and Romans, Jack. Everyone else is on a cash-and-carry basis. He is fun to look at but I think Linda was the brains behind the operation. Isn’t his reason the same as yours for not smoking? Conformity to the social standards defined by the state? I have no idea what his reasoning is, based on his words. I thought that was pretty clear. I can’t imagine, however, that after years of being a pretty open scofflaw on the subject, McCartney was suddenly impressed by the law. My personal reasons began with a desire not to break laws, bolstered by being raised to believe that intoxication of any kind was anti-social and irresponsible, and later bolstered by direct experience of the damage done to individuals and social relationships by drug use, and later still by direct experience with its devastating impact on children and at risk populations, and first hand experience with the consequences of substance addiction. All that. plus the inconvincing nature of arguments that I should do otherwise, my believe that advocacy of drug use by my peers increased the drug problem, and finally, my experience of being offended that every drug user I encountered as parties and socially seemed to take it as a mission to make me join them in the behavior, despite my stated opposition to it, which I took, and take, as the inherent corrupting nature of the drug culture. And while I have close friends who have been drug users in the past and perhaps present, as a general proposition I don’t much like or respect most drug users (as opposed to drug-legalization advocates, who I believe are wrong on this topic but who otherwise can be a admirable as anyone), and I tend not to want to be like people I don’t respect. Maybe you believe that it’s immoral to use a certain drug, but if you also wish such acts to become/remain criminalized then surely you also have to accept responsibility for the dire unintended consequences of such un-thought-through folly? – These certain plants/concoctions/drugs are then sold only by criminals and terrorists; the huge black-market profits are used to bribe and threaten law enforcement officials; the availability and usage rates tend to go up, the prisons become filled to capacity with easily replaced vendors and smugglers; – this list is actually endless. Add to all that the fact that law enforcement and rehabilitation are mutually exclusive. Would alcoholics seek help for their illness if doing so were tantamount to confessing to criminal activity? Likewise, would putting every incorrigible alcoholic behind bars and saddling them with criminal records prove cost-effective? I think most of us already know the correct answer. Ah, “Sire Paul.” I actually mean no disrespect by that; I am indelibly impressed by his music. I wonder if one of his young daughter’s names is (or should be) “Epiphany.” But, like “Sir,” I just don’t seem to think it’s necessary. According to research done in 1972 by a commission appointed to investigate marijuana by President Nixon,,the commission projected that most people would find marijuana enjoyable when they were young and “grow” out of it in middle life. Of course,,they also recommended legalizing marijuana and for the federal government to remove it from the Dangerous drugs list,,as has every commission appointed by congress since,,if not legalized,the decriminalized.,,but what the hell,,it’s just tax dollars that paid for all those investigations for our congress to ignore. That study hardly applies to Sir Paul, as 69 is mighty late to see the light, don’t you think? I fail to see the difficulty here. The message of Sir Paul’s comment, to those who can hear it (let’s leave otology out of this), is a simple one: If you’ve smoked marijuana all your life, you’re probably going to find it hard to say much that’s coherent at age 69. That’s just demeaning, Tom. Rational discourse doesn’t involve vague generalizations of lower intelligence among cannabis consumers. Sir Paul has quite a few foolish quotes attributable to him, he’s definitely not a intellectual heavyweight. Drugs are a dead end that never appealed to me. For some folks cocktails, pot, nicotine, cocaine, etc. is their idea of a good time. (Doesn’t Holy Communion involve a sip of wine? Do we christen ships with Gatorade?) Paul McCartney contributed some great and some not-so-great music to our lives. He never sought to serve as the parish priest. On the scale of ethical lapses, I feel McCartney’s decision to swear off smoking pot at a ripe old age is much ado about nothing. P.S. What’s with Tom Fuller’s deafening dismissal of otology?